Heidelberg February 9, 2017 - The leading dental manufacturer Young Innovations is launching numerous innovations at the IDS trade fair. 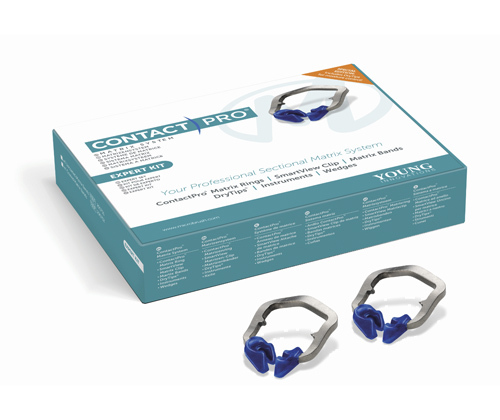 ContactPro®, the matrix system from Microbrush® for class II restorations, is celebrating its premiere. Three different kits with ribbons, rings and wedges as well as high-quality precision instruments made of stainless steel are available. A special feature is the ring with memory effect: it retains its perfect fit and the elasticity even after many applications and thus minimizes the excess formation of the composite. Just as helpful is the SmartView Clip, which guarantees unrestricted visibility and free access to the workspace. Also presented is Young Dental, the world-renowned line for professional teeth cleaning. Shown are new polishing cups, disposable Prophy contra-angle handpieces and pastes for polishing and removal of discoloration. These convince with remarkable efficiency, excellent brightening and neutral ph value. For the professional cleaning of children's teeth, the brand Zooby® is at the start. The colorful prophylactic products are decorated with animals from A like alligator to Z like zebra. This ensures anxiety-free therapy in a relaxed atmosphere and creates a positive foundation for the next visit to the practice. Young patients can choose from a wide variety of polishing pastes in popular flavors. Another innovation is Reflective DryTips® from Microbrush®. The parotid patches keep the teeth dry during the treatment and are an ideal complement to saliva ejectors and cotton rolls, because the extremely absorbent pulp cushions are placed on the inside of the cheek directly in front of the largest salivary gland. The pads are coated on one side with silvery foil, which is aligned to the row of teeth. This results in significantly more brightness, for example for the application of the microscope. ContactPro®, the new matrix system from Microbrush®. Zooby® creates a cheerful atmosphere at the dentist. Young Innovations is a leading developer, manufacturer and distributor of high-quality dental products. The portfolio includes innovative solutions for prophylaxis, diagnostics, restoration, periodontology, implantology, endodontics and orthodontics and world-renowned brands like Young, Zooby®, Microbrush® and American Eagle Instruments®. The American corporation has its headquarters in Chicago and its European centre in Heidelberg, Germany. The enterprise was founded in 1900 and is owned by The Jordan Company.